David Eisenberg’s interest in the structural basis of neurodegeneration and related amyloid diseases took him tfrom UCLA o the MRC Laboratory of Molecular Biology in Cambridge UK for his Vallee Visiting Professorship last year. Known as The LMB, it is considered by many as the home of structural biology, with about a dozen Nobel prizes to its credit, and also a leading center of neurobiology. It was an ideal location for David, the Paul D Boyer Professor of Biochemistry and Molecular Biology, University of California, Los Angeles and an HHMI Investigator. At present more than 40 amyloid-related diseases are known, each associated with its particular protein in fibrous form, but essentially with no effective drugs to treat these conditions, and limited understanding of the molecular basis of disease. Professor Sir Alan Fersht, a Vallee Visiting Professor himself in 2008, was one of David’s two hosts, the other being Dr Michel Goedert, Director of the Neurobiology Division. Alan and David share an interest in amyloid-related cancers. These cancers are apparently caused by the aggregation of the tumor suppressor protein p53 into amyloid fibrils. When in the amyloid fibril state, p53 loses its function as a tumor suppressor, and cells then proliferate without control, producing tumors. The structural and functional features of p53 in biological cells are immensely complicated. Discussions with Michel Goedert and his colleagues also spawned ongoing collaborations: on the aggregation of the amyloid-forming protein alpha-synuclein associated with Parkinson’s disease and the pathologies associated with the Tau protein in the amyloid state, found in Alzheimer’s disease and numerous other “tauopathies,” and, with Dr Garib Murshudov at the LMB, on the difficulty of studying proteins using electron crystallography. 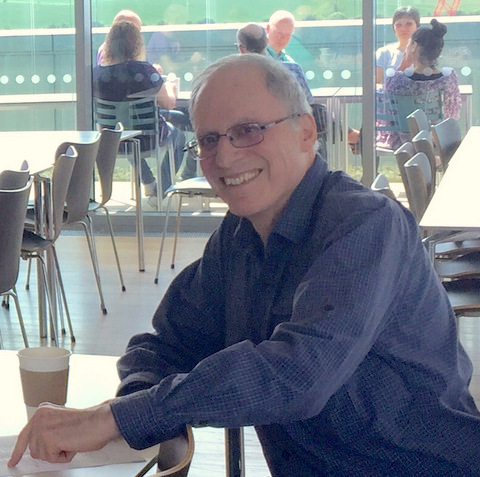 Tony Crowther, Michel Goedert, and and David Eisenberg enjoyed discussions over morning coffee and lunch and were often joined by other researchers of the LMB. LMB colleagues (L-R): Tony Crowther, Michel Goedert, Nigel Unwin, Alan Fersht, and David Eisenberg.